When Carnival Magic visited Grand Cayman Wednesday, it mistakenly anchored in a restricted area. As a result, a significant amount of a living coral reef was destroyed. CND subscribers also read about what it means to be doubly clean ... nothing is free ... and "we never close." Among Cunard enthusiasts the most anticipated day of the year is the day the line announces its world cruises (more than a year away), and the second most anticipated date is the day they open for sale (usually only a few weeks away). The first of those came this week when Cunard said that all three of their queens will again sail world voyages in January 2016. 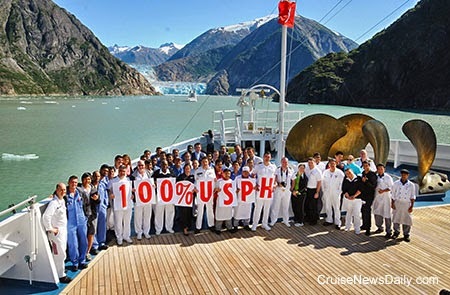 Carnival Cruise Lines said today they will swap Carnival Liberty and Carnival Valor’s home ports during March of 2015. Not everyone wants to pack every moment of their cruise full of activity. Some people like to get some extra rest. It is vacation, after all. arrives (requiring you to be at breakfast at 6am), and instead leaves more like lunchtime. This fall, Miami Dolphins’ fans are going to get as close to experiencing Norwegian Getaway as they can on land, but some of them are going to get to experience the real thing, all thanks to Norwegian Cruise Line being the official cruise line of the Miami Dolphins. Before each home game this season at the Sun Life Stadium, Norwegian Cruise Line will be presenting the “Ultimate Getaway Fan Experience” at the stadium’s Grand Plaza. Seattle, Aug. 27, 2014 – The Ethisphere Institute, the global leader in defining and advancing the standards of ethical business practices, recognized Holland America Line and Seabourn’s Kelly Clark for the second consecutive year in its “2014 Attorney’s Who Matter” list of lawyers in the Best General Counsel category. Clark serves as vice president, general counsel, and chief ethics officer for the Seattle-based cruise lines. This award showcases individuals representing the best and brightest in the legal field — from in-house counsel, ethics and compliance officers to outside counsel. The Ethisphere Institute reviews nominees’ professional expertise, peer and client endorsements, public service and compliance results they have achieved for their companies, among a variety of other criteria. Clark has established a solid reputation during her career with Holland America Line and Seabourn as both a partner to senior management and a developer of grass-roots ethical practices. Clark is the executive sponsor of the combined companies’ ethics and compliance committee, which focuses on improving awareness and education throughout the companies of the importance of working with integrity, honesty and ethics at all levels of the organization. Under her leadership Holland America Line and Seabourn have received several distinctions for business ethics. They were the first cruise lines to be recognized as Ethics Inside Certified, and in April 2014 both companies were named among the World’s Most Ethical Companies by the Ethisphere Institute for the third consecutive year. Clark, who is a Certified Compliance and Ethics Professional (CCEP), received both her Juris Doctor and Masters in Business Administration from New York University in 1993. The Ethisphere Institute is the global leader in defining and advancing the standards of ethical business practices that fuel corporate character, marketplace trust and business success. Ethisphere has expertise in measuring and defining core ethics standards using data-driven insights that help companies enhance corporate character. 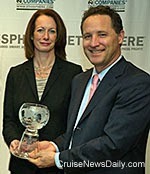 Ethisphere honors superior achievement through its World’s Most Ethical Companies recognition program, provides a community of industry experts with the Business Ethics Leadership Alliance (BELA) and showcases trends and best practices in ethics with the Ethisphere Magazine. Ethisphere also is the leading provider of independent verification of corporate ethics and compliance programs that include: Ethics Inside Certification, Compliance Leader Verification and Anti-Corruption Program Verification. More information about Ethisphere can be found at: www.ethisphere.com. FORT LAUDERDALE, Fla. (Aug. 27, 2014) – MSC Cruises USA announced today that Ralph Aliseo has joined the cruise line as associate director of national and strategic accounts, a newly expanded role for the line. In this position, Aliseo will be responsible for working with existing and prospective National Account travel organizations and the nation’s largest Online Travel Agencies to develop strategic partnerships and marketing initiatives. Aliseo joins MSC Cruises with more than 15 years in the cruise and travel industry. Most recently, he was with Azamara Club Cruises as a strategic business development manager. His previous experience also includes business development positions at Royal Caribbean International and Carnival Cruise Lines. Aliseo began his career as a group manager at Cruise Planners/American Express. A native Floridian, Aliseo currently resides in Coral Springs. By day, The Retreat aboard Regal Princess is a quiet haven meant for relaxing and soaking up the rays. By night, it’s deserted. This fall, however, at least once per cruise, when the stars come out, The Retreat will come alive. The Retreat will become the Night Sky Lounge and take on a South Miami-style nightclub vibe. It must have been some party in Italy. Fincantieri laid the keel for Holland America’s first Pinnacle-class ship last Friday, but they didn’t get around to telling us until four days later. 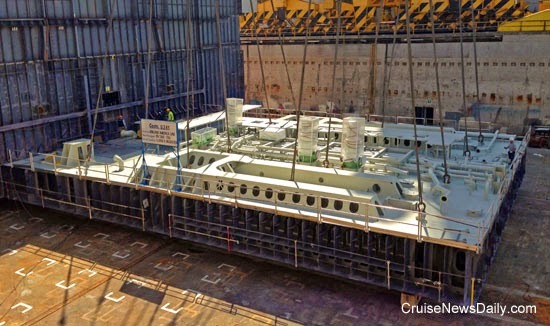 The first block of HAL's first Pinnacle ship in the building dock at the Fincantieri yard in Marghera. Royal Caribbean had a press conference today to promote all the technology that will be aboard Quantum of the Seas when it debuts in a couple of months. There's nothing that’s going to advance us significantly into the future - at least not the individual cruiser - but there are things that are going to make life easier and make things more fun. There are also things that are going move the process of operating a cruise ship ahead and make cruising greener, however. If this was an award show today, the award for best supporting players would be a tie, going to O3b for their advanced internet capabilities that will be available on Quantum, and the ship's own intranet upon which so many conveniences will relay. The big story, from the passenger’s standpoint, seems to be the connectivity and the conveniences it will bring with it. Online media in the Bahamas are reporting the Prime Minister’s Press Secretary, Latore Mackey, was shot and killed this morning as he was driving in the White Road area off Market Street in Nassau. It’s unknown if he was targeted or the victim of a stay bullet. Murders have become commonplace in Nassau, and often in the tourist areas. We have to again wonder when the cruise lines are going to start protecting their passengers by suspending calls at Nassau until the crime rate is lowered. The calls need to be suspended before a passenger is the victim of a murder.